Sustainable Solano is nearing completion of Phase 1 of its “Solano Community Food Centers” project, funded by a USDA Local Food Promotion Program planning grant. The Food Centers are intended to be small-scale, consumer-driven food hubs (including both processed food and raw ingredients), sourced by local farmers, and located in each of Solano County’s seven cities. In Phase 1, we began conducting a feasibility study to determine the supply of local food in the county, the demand for local food among consumers, and explore ways to distribute this food to the people who want/need it. The project’s Working Group also analyzed past studies and literature relevant to the project, and began connecting with other regional organizations who are doing similar work in the areas of food systems and sustainability. The project’s Advisory Board met on Thursday, March 1, 2018, where findings to date were presented by the Working Group. What we have found is that Solano County has a wealth of agriculture, but no organized “local food system.” Before we get into the findings and data, let’s define what a “local food system” is, within the context of this project. By “local”, we mean food that is both produced and consumed within Solano County. A functioning “food system” would refer to farms and ranches earning income through either direct-to-consumer sales, or intermediary marketing channels like schools, grocers, food hubs and the like. Furthermore, the system as a whole would strengthen Solano County’s rural economy and the environment while at the same time providing access to food (regardless of income/economic status), and nutrition education. Data from 2015 shows that farm production in Solano County is around $354 million, and Solano County products are exported to 44 countries. Agriculture creates 4,709 jobs in the County, which accounts for 1.1% of the population. A 2017 study titled “Economic Effect of Agriculture in Solano County” confirmed that Solano has a thriving food manufacturing industry but nearly all of its raw materials come from elsewhere, and most raw agricultural products leave the county for processing. The USDA Agricultural Census of 2012 tells us that there are 860 total farms in Solano County, with 70% of them reporting sales under $50,000. Nearly half of the County’s farms report sales under $10,000. So, that means Solano County has several smaller farms which might be interested in direct-to-consumer sales. (These are the folks we are looking for!) One requirement of the USDA grant is to ultimately increase access to – and consumption of – local food. After consulting with a variety of County-based organizations, we have identified around 40 small / mid-sized farms in Solano who use sustainable agriculture practices, and who may be interested in partnering with us on the project. We need more data directly from the farms to estimate sales volumes; this is one of the goals for the second stage of the project. 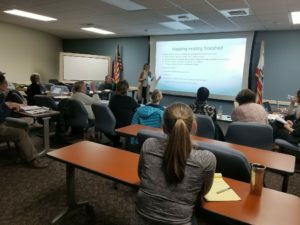 On the “demand” side of things, we focused on gathering demographic information about Solano County, and also statistics in food purchasing. Our population of 440,207 people is racially diverse (30% White, 26% Hispanic, 16% Asian, 15% African American, and 4% Other), 50% female, and nearly one-quarter of the population commutes to work outside of their homes in Solano. We estimated that Solano County residents spend around $1 billion annually on food, with only $2.1 million (0.2%) of those sales going toward Solano-grown products. About 33% of Solano County has a household income of over $100K, and 26% has an income of under $35K. There are 113,805 people who are eligible to receive food assistance (SNAP/CalFresh/EBT). Data from the Ecology Center in Berkeley showed that $52K per year of EBT and Market Match funds are spent at four different farmer’s markets within the County. However, when taking into consideration that the total amount of available food assistance funding per year is around $170 million, we should certainly expand ways in which residents could channel these funds into local food purchases. One idea to explore is “Import Substitution.” In other words, we’d like to substitute non-local food purchases (i.e. purchases at chain grocery stores) with purchases of food grown by Solano County farmers. If we could replace just 1% of the County’s total food spending, it would keep $10 million within the County’s agriculture system. Likewise, if applying this same method to food assistance money, 1% of the total funding would generate $1.7 million in the County. These two sales strategies combined would make $11.7 million available for local farmers (vs. their current estimated $2 million in sales). Phase 2 of the project (March-June, 2018) includes an exploration of HOW we might accomplish this, as well as the completion of two other objectives: 1) complete a study of relevant, successful business models of local food systems and local food enterprises (Sierra Harvest, Ceres Community Project, Three Stone Hearth, Fresh Approach, etc. ), and 2) collect primary data from Solano County’s farmers, via a survey and meetings, so we have a very clear picture of the available supply, opportunities, and barriers to success. Phase 2 will also include developing a business plan, and then outlining implementation for our next steps, which may be beyond the USDA grant. As we have delved into this research, major themes have emerged. We need a systemic, holistic look at Solano County’s Local Food System, and how this system might benefit key stakeholders: farmers, distributors, processors and community members of all socio-economic backgrounds. A good local food system should be viable economically (affordable farmland, decent wages, profitability for farms, several outlets for affordable local food), environmentally (healthy soil, safe pesticide use, clean water, reduced food miles) and socially (local food access for everyone, informed consumers, diverse farmers, healthy communities). Public education on not only the nutritional value of local food, but also the holistic picture will be key. To create a vision, there will need to be cooperation and dialogue across various stakeholders, agencies and community representatives across the County. Finally, when it comes to implementation, we will need a managing agent, the capacity to build out the system, and funding. We are exploring the idea of a Solano County Local Food Summit to begin bringing all these elements together. Any questions or comments about the project may be directed to Stephanie Oelsligle Jordan at: Stephanie@SustainableSolano.org / 773.960.8061 (mobile).